Ingredients: If you liked the action of Bourne Supremacy, the special effects of iRobot, and the total lack of anything original, let’s say Terminator Salvation, then you will like this movie. So I just got done seeing...man, what was the name of it? I keep forgetting the title. Why yes, this is a clever pun on the new Total Recall release, but it’s also a quick summary of the movie. Douglas Quaid (as played by Colin Farrell) is an assembly line worker in the far off year of...the future. Chemical weapons have made most of Earth uninhabitable except for two land-masses, the United Federation of Britain and “The Colony” a.k.a. Australia. Quaid experiences action packed dreams and grows bored with his mundane life so he decides to spice up his activities with a visit to a company called Rekall. While in the process of downloading a cool secret agent experience, Quaid finds out that his mind has already been altered with new memories. Quaid’s wife, Lori (Kate Beckinsale) reveals that she was a secret agent working for Chancellor Cohaagen (Bryan Cranston) tasked with keeping Quaid under control and series of chase scenes ensue. Eventually Quaid meets up with the woman of his dreams, Melina (Jessica Biel), and she tells him that the fate of “The Colony” is in his hands and in his head. By the way, I actually don’t recall anyone even mentioning Melina’s name; I just assumed they kept the name “Melina” from the original but for all I know they could’ve called her “Mary Sue” and it would have gone right by me. 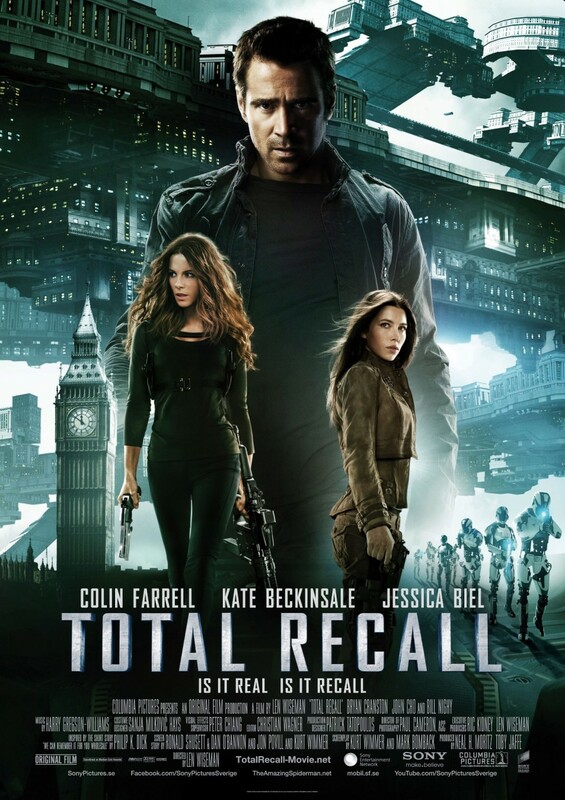 The Total Recall total remake is just so bland and uninteresting and way too long. The movie clocks in at just under two hours and you can feel it. And for a movie filled to the brim with action scenes, nothing really happens. It’s just one chase scene after another, back to back with little in the way of character development. Or any development for that matter. We’re given these sweeping, Blade Runner-esque shots over futuristic cities but never given a chance to interact with any of it. It’s all just standard. Standard foot chases. Standard car chases. Standard gun fights. Standard face-off with the main bad guy at the end. In terms of science fiction thrillers, there is absolutely nothing new and in terms of action movies, it just gets to repetitive and boring. And did I mention lens flares! Lens flares as far as the eye can see. And because the film felt the need to throw in references to the original -- nothing actually important mind you, just references -- I now have free reign to talk about the 90’s Total Recall. The first Total Recall was and still is a classic when it comes to smarter action flicks. Even though Douglas Quaid was suppose to be an everyday guy just getting by in the future, and a hallow shell of who he use to be, Arnold Schwarzenegger gave the character some depth. 90‘s Quaid would crack jokes, show his rage and frustration, and when he finally started fighting for a cause you understood why. Farrell’s Quaid is just dull and uninteresting. Just a blank slate with no personality. The original Cohaggen’s plan actually made sense because there really were terrorists challenging his authority. In the remake, he makes up the terrorist threat for no reason and his goals are ridiculously convoluted. Richter, Cohaggen’s original right hand henchman that was chasing Quaid (and who was also brilliantly played by Michael Ironside) had a reason for disobeying orders and trying to kill Quaid instead of recapturing him. Kate Beckinsale’s character goes on a mad killing spree just because, there’s absolutely no thinking involved. Bottom line, if you must see a Total Recall film this year, just watch the 1990 version starring Schwarzenegger. And keep your fingers crossed they don’t try to remake any of Arnold’s other films. And whatever you do, don’t bring up Commando, heaven knows what Hollywood would do if they got ahold of that. Huh? They already have plans for a Commando remake? Wonderful.